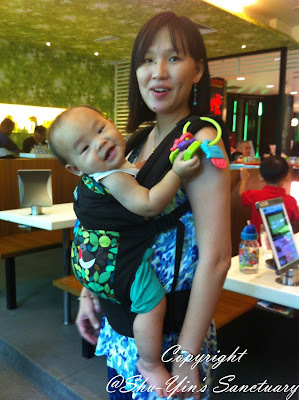 My first baby carrier was the Pikkolo which I loved, but I am keen to try on other baby carriers. So I was delighted when Aboo Family sent me a Boba 3G for review. I was indeed pleasantly surprised when I saw the innovative features not seen in other carriers. Ok, will talk more about it later. So Who and What is the Boba brand? Boba brand was created by a family of husband and wife, Robert and Elizabeth Antunovic (plus 2 kids) while backpacking around the world in 2007! 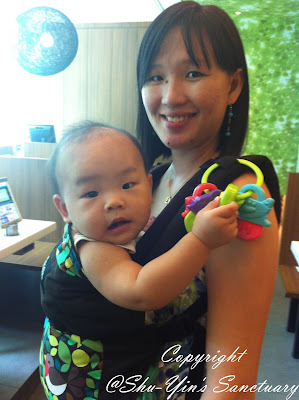 Now, 6 years onwards and the Boba Team is a group of dedicated people all working together to support babywearing, natural parenting, and secure bonding to parents. 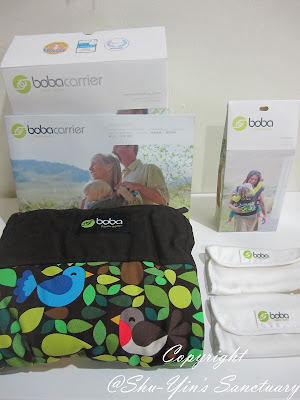 I love Boba's mission, which is to "provide comfortable and durable products to parents throughout the world and to give them a helping hand in raising confident, joyful and compassionate children." 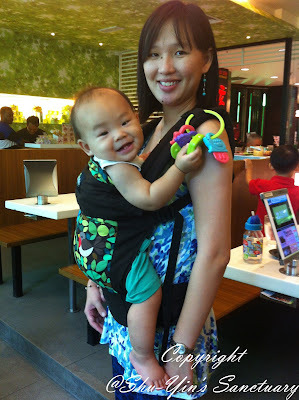 I have been using the Boba 3G for nearly 3 months now, and I hereby declare that this is currently my FAVOURITE baby carrier! Ok, let me tell you why. It comes in a sturdy white box, with a little window at the side of the box, revealing the design of the carrier, a Boba Carrier 3G Tweet. 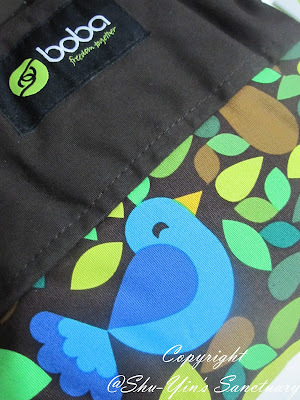 Upon opening up the box, it reveal a carrier with a lovely Tweet design, with three birds among leaves of shades of brown , green and yellow. It was really a fresh and vibrant design. I really liked it at first glance. I spread the carrier open, and you could see the body, the hood, the waist belt, and also the back straps. If you look properly, it also comes with removable foot straps (on the waist belt in this pic). 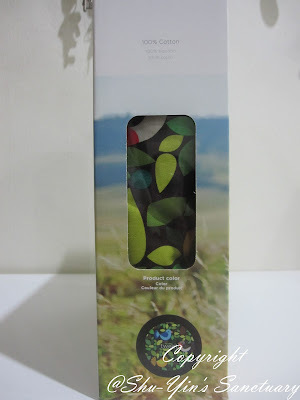 First impression was that the material is sturdy and looks really compact. By the way, it is made of 100% cotton. There is an instruction manual that comes with it in the box, a guide that tells you the features of this Boba 3G and also instructions on how to wear it correctly. 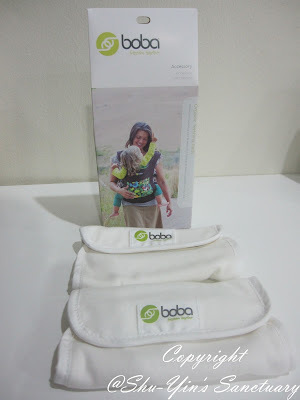 Aboo Family was also kind enough to send me the Boba Teething Pads, which are made to snap around the shoulder straps of the baby carrier. 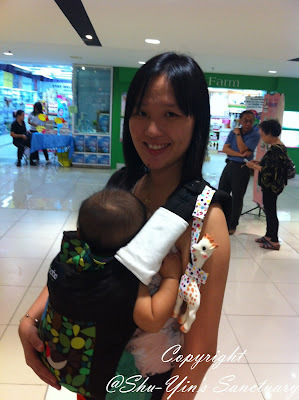 By experience, I definitely need this because Khye loves biting and sucking the shoulder straps whenever I babywear him. 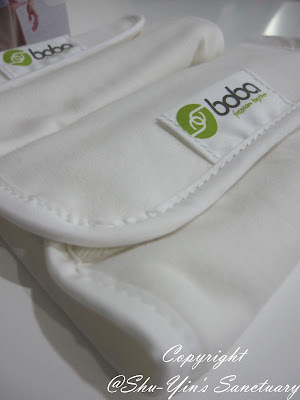 These Teething Pads are made of 100% organic cotton, and is free of potentially-dangerous chemicals and dyes. They are so soft to the touch, and I couldn't stop myself from squishing them. I'd first put Khye in when he was about 8 1/2 months old, I did not use the infant carrier adjustment. 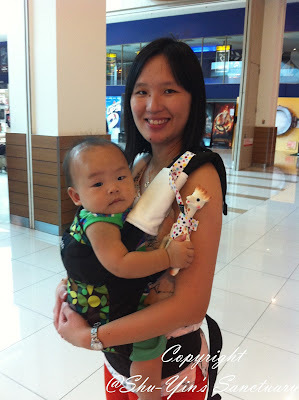 I straightaway carry Khye in the toddler adjustment. 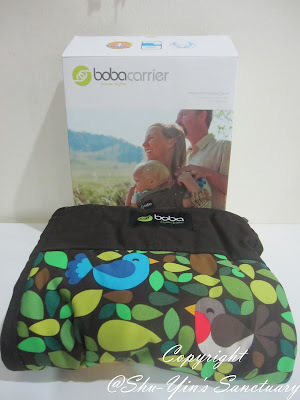 But if your baby is still an infant, this Boba 3G can convert to an infant carrier without an insert! This is good as an insert means an extra troublesome piece to bother with. 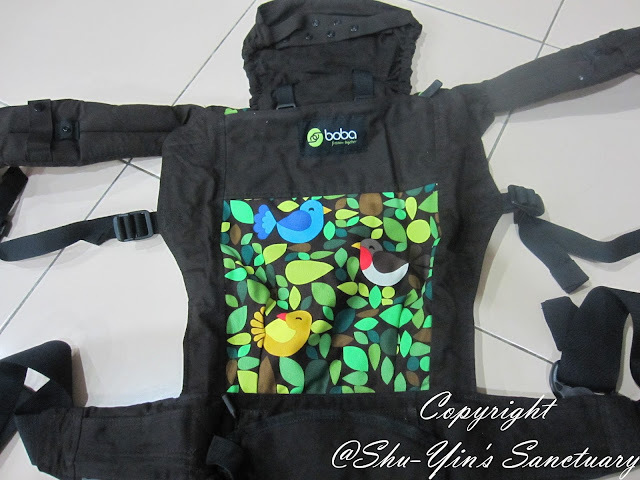 Boba is a Soft Structured Carrier (SSC) that is intended for babies and children between 7-45lbs (~3-20kg). 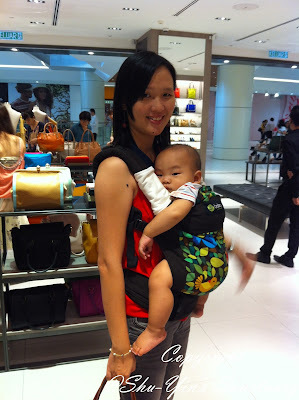 Khye was more than 9kg by then but he was still a baby, so I'd started babywearing him using the front carry. I'd no problem being fitted with the waistband which has a range of 25” – 58”. So it fits even the petite Asians. The shoulder strap fit was snug and good too. The moment I put Khye in, he was as happy as a lark! Look at his smiley, happy face! If I remembered correctly, it was Shern's birthday and we were at Sakae Sushi, Gurney Plaza. Khye was fussing in his baby seat, and so I babywore him front carry facing in to keep him entertained while hubby and Shern finished their meals. 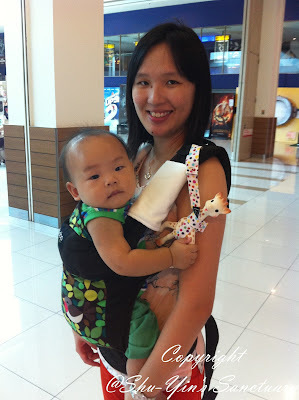 Look at Khye holding on and playing with the toys sling to the Shoulder Strap Holders. 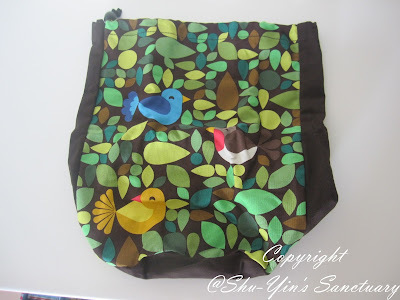 This is one of Boba's unique feature, the Shoulder Strap Holders on both sides, to keep purses and diaper bags in place. 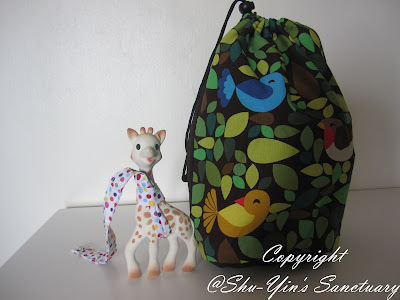 But I'd found another use for the Shoulder Strap Holder, that is to snap Khye's toys in it. 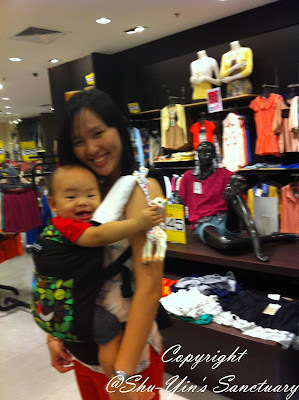 Khye loves grabbing them and playing with them while I babywear him. Khye playing with it again when I went to fetch Shern from school. Good way to keep him entertained, and the toy won't fall onto the ground. 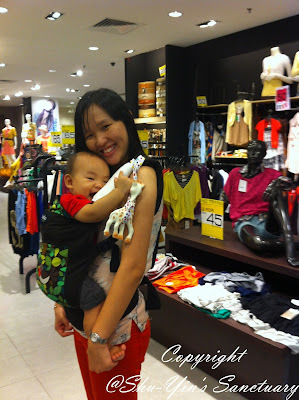 And this is Khye holding on to another favourite toy of his, Sophie the Giraffe Teether. 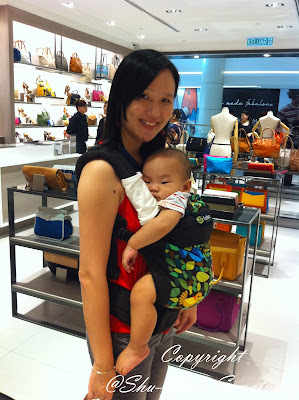 I used a Toy Strap made by the talented Serene, and snapped it into the Shoulder Strap Holder, and hey voila, most of his toys can be strapped safely and used on-the-go with this Boba carrier. I too snap my purse/bag onto the Shoulder Strap Holder to keep my purse strap from falling off my shoulder all the time. It is actually such a good feature and I love the multiple use of it. 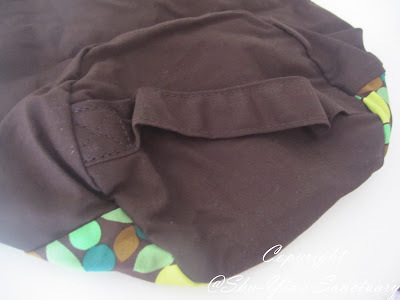 Another feature of Boba 3G which I super duper love is the multiple pockets for on-the-go storage. Sometimes I may not feel like carrying a purse, so these pockets are very convenient. 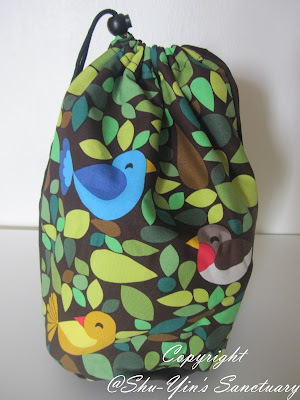 The zipper pouch may be used to store your hood when not in use. 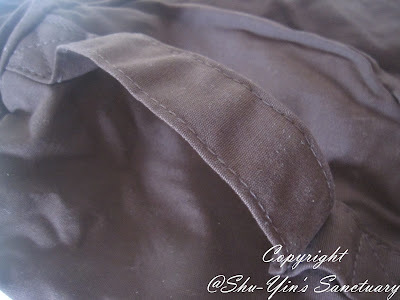 And at the waistbelt, there is two small zipper pockets to keep my mobile phone, or for some cash and cards. These are small stuff but very essential. Now I cannot imagine using a baby carrier without pockets! It is quite often that I go wandering off alone with Khye shopping in malls. Hubby would bring Shern to Toys 'R' Us or to the bookstores, and then I'm free to just go window shopping with Khye hugging me like a Koala. 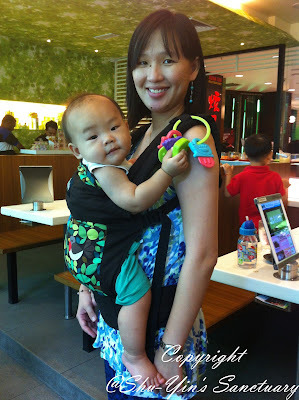 With the Boba 3G carrier, it is way easier to babywear him and leave both my hands free to rummage through clothes, etc. 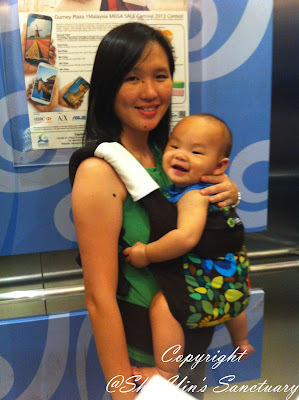 It is also way easier to travel down escalators by babywearing him as maneuvering a baby in a stroller going up and down the escalators can be very tricky, and totally not recommended. Use the lifts instead, and yes I do understand, sometimes I'm too lazy to use the lifts. And I feel so comfortable and confident using this Boba 3G alone with Khye because I can babywear him ALL BY MYSELF without any help from anybody! The buckles are so easy to adjust. I just wear the waistbelt first, and then put Khye in. Then slowly wear both the shoulder straps and then buckle the chest strap behind me all by myself! The chest strap is also easily adjustable and can be glided up and down for maximum comfort and easy to reach by myself. This way we can just go anywhere ourselves and take lotsa photos in front of mall mirrors! Look at both of us so happy and giggling! 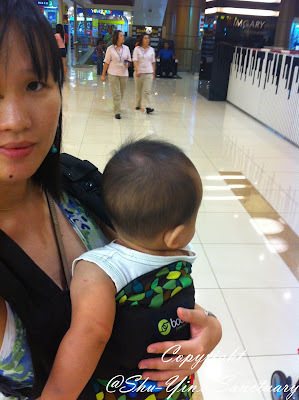 Even to the airport I was babywearing. You know the Penang Airport, where the receiving hall is like so damn cold? And I forgot to bring him a jacket or a long sleeved shirt. So how? Babywearing solves the problem! Both of us stuck together and the body heat keeps both of us warm, 'til Khye fell asleep in it, while I queued up McCafe for some deserts! 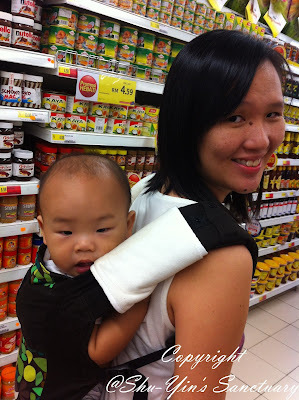 And this is me babywearing Khye again when we brought Shern to the Carnival at PCC earlier this month. 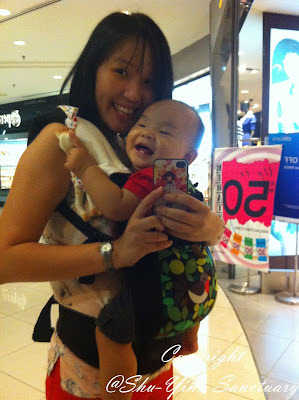 Khye was happy to just tag along being close to mummy and seeing everybody and everything! 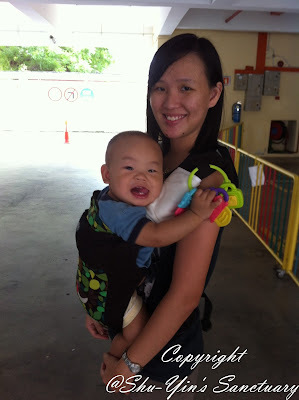 Without the baby carrier, I would just leave Khye at home with my mum or something as I wouldn't be able to carry him the whole time while bringing Shern to enjoy the carnival! So I must say this Boba 3G brings Khye to more outings! 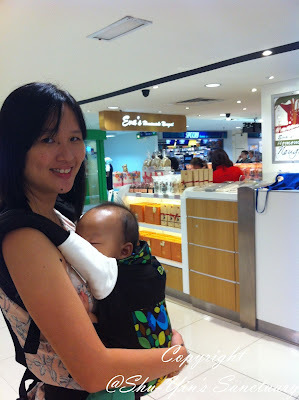 And here is sleepy Khye, all tired, but this crazy mummy was all hyped up to visit the new Gurney Paragon! 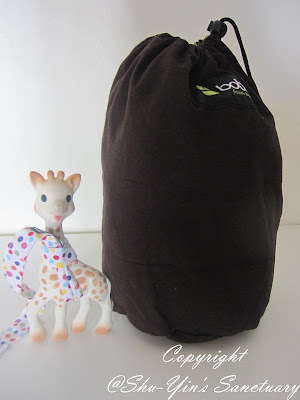 No problem as Khye falls asleep easily in this snuggly Boba 3G! He is just comfy inside! 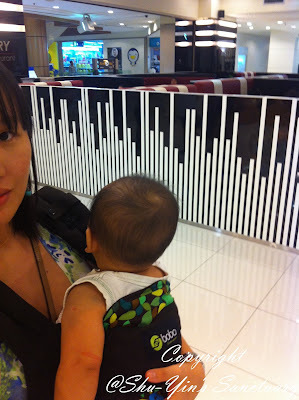 So quite often, Khye fell asleep in this Boba 3G. This is him asleep while I went grocery shopping at Tesco. 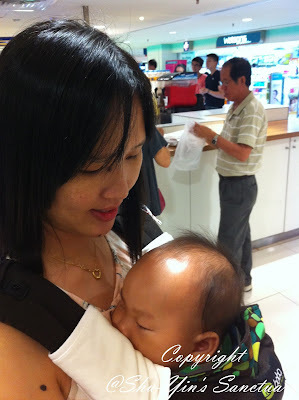 Oh, and did I mention that I could even breastfeed in this Boba3G? All I needed to do was just to loosen the shoulder straps to lower baby's head down. And then I pull up the Sleeping Hood to cover some modesty, and Khye was suckling away! 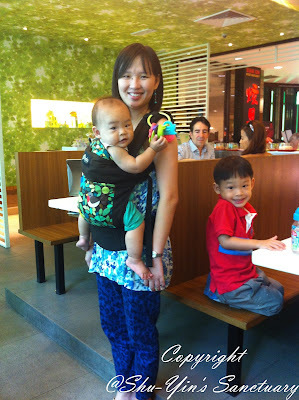 No one even knew I was breastfeeding Khye on-the-go in the Boba 3G! I loved this Boba 3G so much that I felt a need to purchase the Boba Stuff Sack. 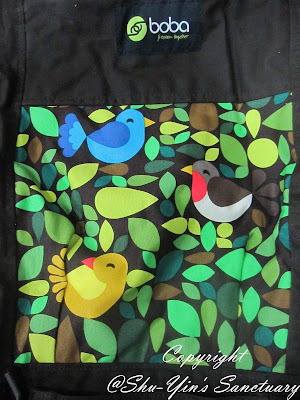 Bought the one in Tweet to match my baby carrier design. 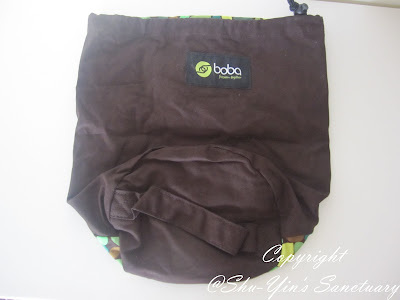 The Boba Carrier Stuff Sack is made of 100% cotton and is designed to hold and protect my Boba 3G when not in use. I actually use it on-the-go as well and I bring the Stuff Sack out with me. I just simply roll up my carrier and tuck it inside and it fits perfectly. 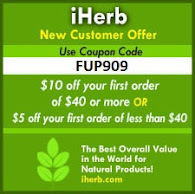 It is not big and is quite convenient to use on-the-go as well. Here I put Sophie the Giraffe next to it so that you can see the actual size of the Stuff Sack. As you know Sophie is not big, and putting next to it, you can see that the Stuff Sack is almost twice the height of Sophie, and the width is almost double Sophie. Totally not bulky and is quite a nice size. When is empty and folder flat, this is what you get. 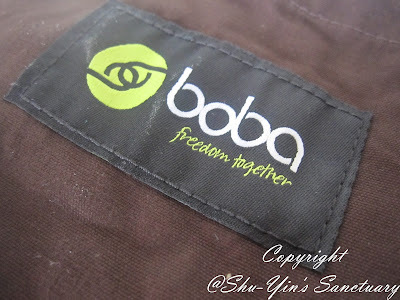 The Boba logo is on the back of the Stuff Sack. 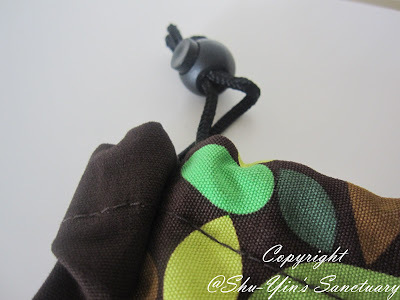 The Stuff Sack closes with a drawstring and a stopper to tighten it. And at the bottom is a handle for you to carry the Stuff Sack. So you just overturn it and carry it just like that. To tell the truth I find it a bit silly that the design is such that you need to overturn the Stuff Sack to be able to hold on to the handle to cary it. This made me conscious if I want to put an extra thing inside such as a hanky for fear of it falling off and I may not notice it. 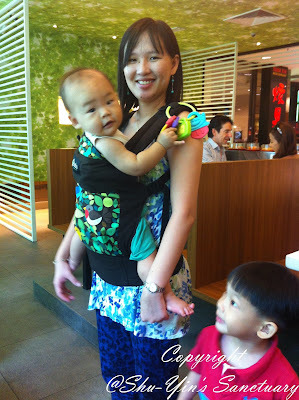 More recently, and now that Khye is almost 11 months old, I tried the front carry as well as the back carry. 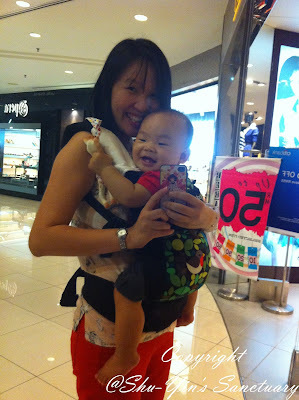 Khye was still happy being carried behind my back (mummy is still near to him!). One thing I like about this Boba 3G is that it has a higher body compared to my Pikkolo, and thus making me feel more secured when doing a back carry. If the body is too short, I may be afraid that somehow Khye might just fall off (though I know he wont!). But these few extra inches of height also help to keep my center of gravity closer to my body and support Khye's back, which is a good thing too. But one thing though. Because Khye is still small, I can't put him in on the back carry position all by myself. Khye doesn't know how to crawl and hold on to my back yet by himself while I wear him up properly. Actually it can be done so, but I just don't as I don't feel that confident yet. Maybe it needs more practice! Boba 3G also has the foot straps attached to the waist belt (I took it out because it was meant for older childen) to keep older children comfortable while enabling a healthy sitting position. The footstraps not only give tired little legs a rest, but support the legs in a flexed abducted (froglike) position which naturally tilts the pelvis, fills out the hip sockets and aligns the spine. I would try this out when Khye gets bigger! I am very pro babywearing, saying this only because babywearing really works for me! By babywearing Khye, I hope to enhance the bond between me and my baby, and I can see for myself how calm and contented a baby he is. 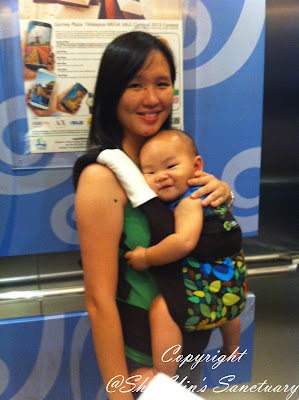 Hands-free with a happy baby, isn't that such a great combination? 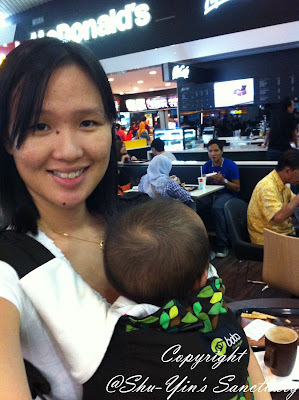 So with all these features of a Boba 3G, it has now become my favourite baby carrier. Just the multiple pockets and shoulder strap holder features already won my heart! 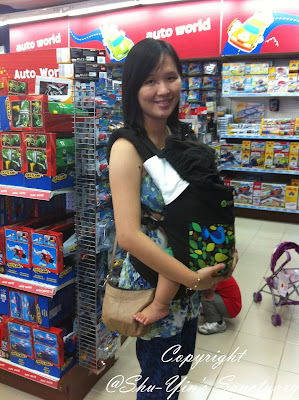 So parents out there, if you are looking for a baby carrier, this may be the one you are looking for! Please visit Aboo Family website for Boba 3G designs. * Disclosure: I received a Boba Carrier 3G Tweet and a pair of Boba Organic Teething Pads for review purpose, but no monetary incentive was received. All text and opinions are of my own and represents my honest opinion of the product(s). 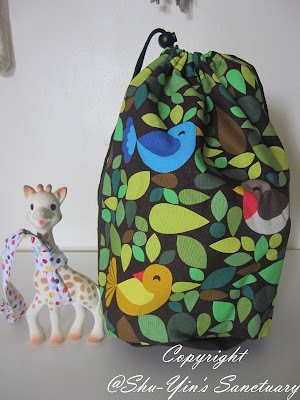 * I purchased the Boba Stuff Sack Tweet with my own money from Aboo Family. Depends on your needs and lifestyle. My Ergo Performance is lighter and more breathable thus more suitable for outdoor use in hot and humid Malaysia. Boba3G however is prettier and has all the small features that I love such as the shoulder strap etc. Not too hot either but definitely thicker than ergo performance. 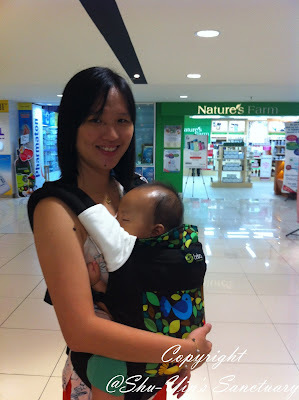 I usually bring Boba when babywearing in malls, but I choose Ergo Performance when I babywear outdoors or when I travel. Boba3G is cheaper comparatively to Ergo Performance though. Both are great baby carriers. Hi shu yin, my baby currently 2months. 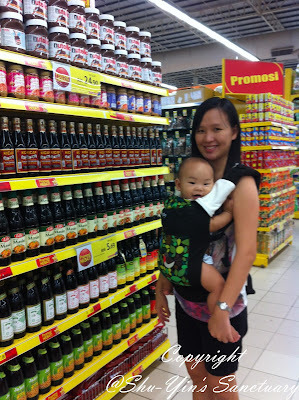 He easily get heat rash..Thinking to choose ergo, manduca or boba, in ur opinion which 1 will be more suitable if I would like to use it for travel n shopping as well.TIA. Both Ergo and Boba carriers are good carriers in terms of positioning. I haven't tried Manduca before, so can't comment. 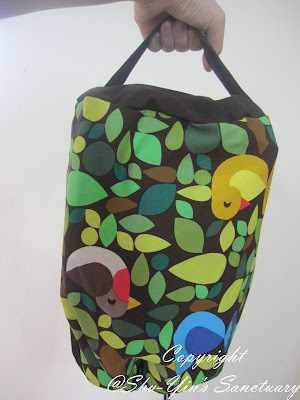 Ergobaby carriers tend to be larger in size and your 2mo baby definitely need the infant insert for now. Ergo baby is rather wide and thus toddlers up to 3 yo can still fit into Ergos. This is an added point too. My baby us big sized and i fit him in an ergo when he was about 8mo so he had no problem. Mine is the Ergobaby Performance (which is a more lighter and breathable version) and thus is very light and like I said breathable. 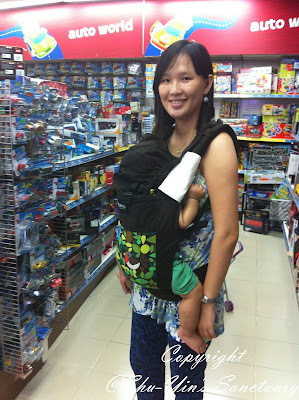 As for boba, it is certainly a much slimmer carrier compared to ergo performance, and can fit baby without any extra inserts. However pls do note that boba is more thicker compared to ergo performance (as it is a more lighter n breathability ergo range). So if you go outdoors in our hot n humid climate, it may be more hot for your baby in a boba compared to ergo performance. Pls also take note that now has a newer version of Boba 4G (instead of 3G). Price wise ergo performance is a bit more expensive. A rough range through googling, ergo performance is about RM459, while Boba 4G is about Rm400. So a price difference of about Rm50 i suppose. I love these 2 carriers. 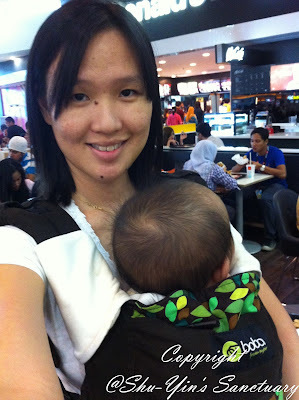 I use my boba when i go to aircond places, n my ergo performance when i go outdoors. Each have their own pros n cons. So it all depends on your lifestyle. Do you bring your baby outdoors often? Or usually only to airconditioned places? As for me, I usually bring my Ergo Performance when I go for travel, especially to tropical countries (I brought it to Spore n KL). As your baby easily gets heat rash, I reckon maybe Ergo Performance might be better? Hope this help u. Let me know if u hav any more ques. Glad to help if i can. When it comes to safety, also feel about the baby’s placement, the right head and neck support, and also the breathability from the fabric. Throughout the testing, we considered hands-on, short-term use in addition reviews from people who’ve used specific kinds of these products for some time https://www.babymonitortown.com/.